Located 78km from Cusco via Pisaq and 57km via Chinchero, it is located in the heart of the Sacred Valley and is known as the "Pearl of the Vilcanota" with beautiful countrysides and a healthy climate, located at the foot of the majestic snow-capped peak Chicón. Urubamba, the archaeological capital of Peru, has many possibilities for tourist activities, especially adventure tourism because of its natural beauty. In the rain season there is an abundance of seasonal fruit. The area was also a pre-Hispanic agricultural center. 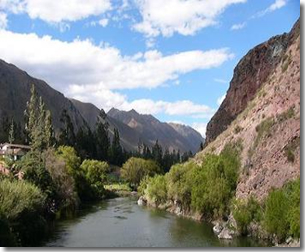 Less than one hour by bus northwest of Cusco lies the valley of the Urubamba River. It's easy to see why the valley was considered sacred by the Inkas with its spectacular panoramas and fertile alluvial low lands, everything that is planted here grows with such abnormal vigor - especially corn. The corn here grows approximately three times the size of the corn grown in the U.S. and other parts of the world. The Inkas gave life to the stone and they built urban centres, palaces, temples, agricultural constructions, and trails. Urubamba is still a pleasant oasis, a resting spot for trekkers, an outfitting spot for whitewater rafters and a good spot for lunch at one of many quintas. Among geraniums and hibiscus, hummingbirds and parrots will keep you company while you eat grilled meat or trout and drink Cuzquena beer.